The U.K. is investing 300 million pounds in its scrapping program. As U.S. lawmakers debate a cash for guzzlers incentive, auto dealers in the U.K. are preparing for a spurt in new-car orders on Monday, when a car-scrapping program takes effect. "I think the industry will be 150,000 to 200,000 up because of it," said Ingvar Sviggum, Ford of Europes head of sales and marketing. Sviggum said that since the subsidy was announced last month, Ford of Britain has received 1,400 orders in advance of the plan's official start. Other automakers also are reporting increased sales inquiries, according to U.K. automaker lobby group the Society of Motor Manufacturers and Traders. In the United States, legislators are considering a cash-for-guzzlers bill that would provide vouchers of up to $4,500 to people who trade in cars and trucks for new, more fuel-efficient vehicles. The program, if approved by Congress and signed by President Barack Obama, would lead to about 1 million new-vehicle purchases, Rep. John Dingell, a Michigan Democrat, has said. The U.S. auto industry hopes to mirror the success of such ventures in other markets. U.S. vehicle sales have plunged 37.4 percent this year through April. Germany posted gains of 19 percent in April and 40 percent in March after passing its measure in February. Similar programs have stabilized sales in France in Italy. Spain's scrapping program also starts Monday. "There has been a good response to the scheme ahead of the official start date and industry is confident that this will be translated into additional orders," Paul Everitt, the U.K. trade groups CEO, said in a statement. 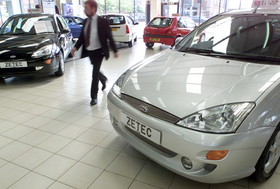 "The scrappage scheme ... has already started to get people back into showrooms." Sviggum said not everyone visiting Ford's dealers in Europe wanted to get rid of an old car. The same could happen in the U.K.
"We have seen people who are not scrappage customers coming into our showrooms because of (the incentive)," Sviggum told a conference call with journalists earlier this week. The program gives a 2,000 pound (about $3,035) discount to customers who trade in a car that it older than 10 years for a new model. The U.K. government has invested 300 million pounds in the program. The government covers half of the incentiv; the remaining 1,000 pounds comes from the manufacturer or dealers. There is enough funding for 300,000 new cars. The U.K. has been hit hard by the economic downturn. The country's new-car sales have been down in each of the last 11 months. Through four months, new-car registrations were down 28.5 percent to 613,833 units, according to figures from the European auto manufacturers association, ACEA.